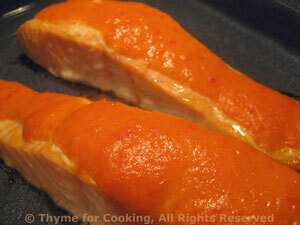 Baked Salmon with Red Pepper Sauce, Thyme for Cooking easy recipes. Since the risotto is a rather hearty side dish, and we have lots of vegetables in the soup, we are not having another side dish with this meal. 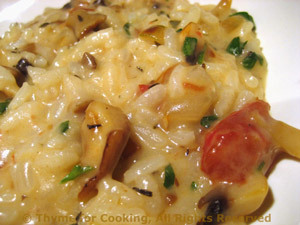 The risotto makes a bit less than the regular recipe; it's cooked part way before the soup; finished after. Vegetable soups make a perfect winter first course. They're easy, warming and healthy. The 'cream' in this soup comes from yogurt or milk. A hint of 'heat' comes from the hot mustard. Roughly chop broccoli and onion. Melt butter in a medium saucepan. Add onion and sauté until starting to get tender. Add chicken stock, marjoram and broccoli. 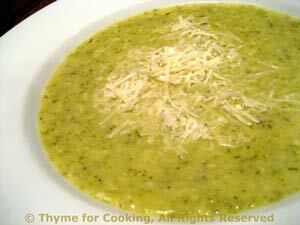 Bring to a boil, reduce heat, cover and simmer until broccoli is tender, 10 - 12 minutes. Purée soup, using only as much stock as needed. Reserve the rest of the stock. Return the soup to heat, add mustard and enough reserved stock to get the consistency you like. Remember the yogurt / milk and cheese will thicken it a bit again. Bring to a boil, reduce heat and stir in the yogurt or milk and cheese. Heat, stirring, but do not let it boil or you will have cheese strings! Serve, garnishing each serving with a sprinkle of cheese.